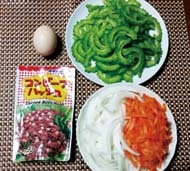 The ultimate summer vegetable on Okinawa is goya, known as nigauri in Japanese and bitter melon in English. It’s a nutrient-rich vegetable that especially contains about double or triple of Vitamin C in a lemon. 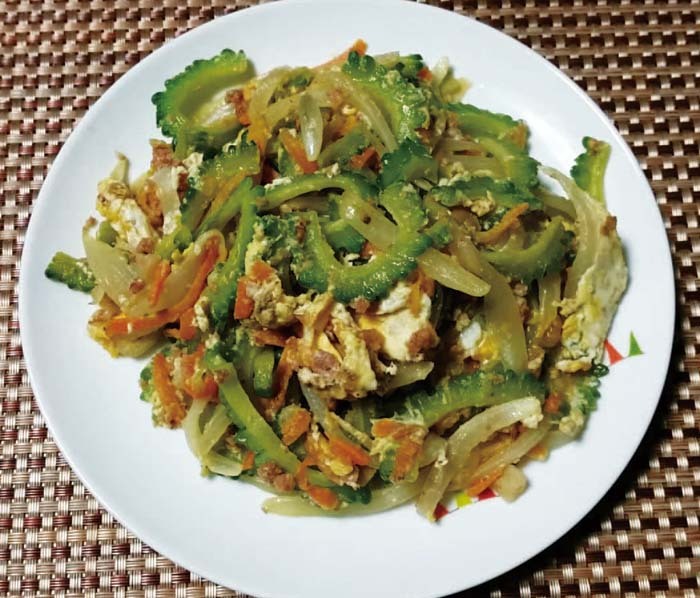 Goya chanpuru (mix in Okinawa dialect) is considered effective against the oppressive summer heat of Okinawa making this dish a staple summer meal. Almost every cook and housewife makes the dish in their own way. Here’s one cooked with vegetables, egg, and corned beef hash. All ingredients are available in every grocery store. Wash and cut goya in half lengthwise and gouge out the pith with a spoon. Cut goya into 2mm thick slices, carrot into stripes, and onion into wedges. First, sauté carrot and onion in a frying pan until wilted and add goya slices. Add corned beef hash and mix all ingredients. Add salt and pepper to taste. Add a beaten egg, turn the heat off and close the lid. Ready to serve when the egg is cooked. The meal has enough taste from the corned beef hash and no seasoning is necessary. However, some cooks add one table spoon of chicken bouillon powder while others sprinkle dried bonito flakes or sesame oil over the dish.